Didn't Juventus pay attention? Haven't they seen this team before? Where are the lessons learned from the debacle in the first leg of the last round against Atletico Madrid ? 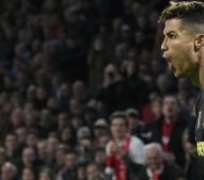 Juve may well have signed Cristiano Ronaldo to win them the Champions League and they have him to thank for simply having something to work off for the second leg against Ajax next week, after netting a header with their only shot on target in a 1-1 draw in Amsterdam. The Ededivisie leaders were everything they were against Real Madrid in the last round; effervescent, positive, fearless. Real managed to suffer and survive the Amsterdam leg before capitulating in the second in front of a stunned audience at Santiago Bernabeu. There are no guarantees either that Juventus won't go out next week in Turin. Ronaldo's continued ability to get into the right spaces and take chances – even in a game that brings so few of them his way – is the sole reason Juventus are still here. This was supposed to be a campaign to match their lofty ambitions. They have gone close in recent seasons – losing in the final in 2015 to Barcelona and 2017 to Real Madrid – and the final piece of the jigsaw was Ronaldo. He has kept his end of the bargain and continues to score as indiscriminately as he did during his nine seasons at Real but Juventus are flagging. They might well be on the brink of yet another Italian title but that hardly matters any more. This is the competition they are judged by. These are the standards they must meet. Arguably, they have showed up in a collective sense only twice this season in Europe – away at Manchester United and at home against Atleti in the last round. Elsewhere, they have blown hot and cold. Max Allegri is a coach in demand all over Europe but has been unable to provide a consistent tonic on the continental stage. Big name individuals – Leonardo Bonucci, Federico Bernadeschi, Paulo Dybala chief among them – have not achieved anywhere close to the kind of consistent form required for a good run in Europe. A lack of midfield controller – a long-standing issue – continues to plague the team. How they could have done with an Axel Witsel type to dictate the play and put fires out, a player they were linked with before his move to China a couple of years ago. Juve – quite frankly – are lucky to be as close to Ajax as they are heading into the second leg. And they have Cristiano to thank for it. Ajax have now moved past the description of naïve young dreamers. They are here on merit. There is nothing lucky about their ongoing participation in this, the latter stages of the Champions League. These kinds of performances should not be taking Juventus by surprise. If they are getting outplayed, then it is all on them. Either they are not good enough nor well prepared enough. Whatever the case, they won't look back on this night in the Netherlands with any great fondness. While the likes of Manchester City and Barcelona might be relishing the home ties to come in the second legs, Juventus have reason to be fearful. They are armed with an away goal admittedly but there is nothing to suggest that this was an off-night and better displays are around the corner. This is their European form, the odd superstar Ronaldo hat-trick aside. This is what they have to work with. Their plan at 2-0 down to Atletico was to get the ball to Ronaldo and pray. How fortunate they were that he recovered from the injury suffered on international duty with Portugal last month to take his place in the starting lineup here. Without him they would have looked very ordinary indeed against one of Europe's coming forces. Donny van der Beek, David Neres, Dusan Tadic and more are worthy of their place here at this stage and don't deserve patronising. If they can hit Juve how they hit them here, then it will be them and not the favoured Italian champions in the semi-final.